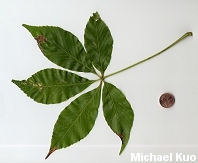 Small tree with leaves composed of 5 palmately arranged leaflets; fruit a distinctive prickly ball; growing primarily in the Midwest. 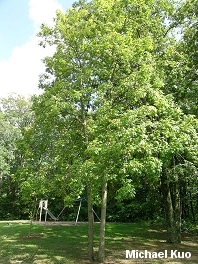 Habitat: Usually an understory tree, mixed with other hardwoods; growing primarily in the Midwest. Stature: 30-50 feet high; to 2 feet in diameter; often spreading and bush-like--or growing as a small tree with a broad, rounded crown. Leaves: Compound, composed of 5 leaflets 3-6 inches long, arranged palmately; finely toothed; yellowish green; malodorous when crushed. Bark: Thick; gray; deeply furrowed or plated; malodorous. 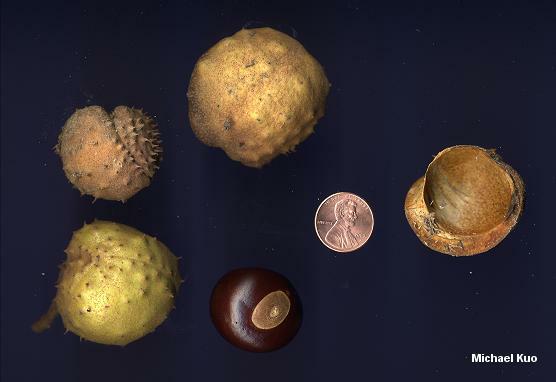 Fruit: A large, prickly ball 1-2 inches long; interior a large, polished brown seed.